Ok. I know. My obsession with Meyer Lemons is serious. What can one do when you only get a few months in a year to enjoy those beauties? Remember sometime back how crazy I was about Meyer lemons, that I made Raspberry Tukmaria Meyer Lemonade? If any of you made it at home, I hope you preserved those pretty squeezed lemon leftovers. Because, I’m back with something hot and spicy this time. And guess what? Lemon pickle is just going to get better! Because lemons are pretty much available all through the year, lemon pickle almost had the status of being a staple at home. At least one giant glass or porcelain jar or “Jaadi” (that’s how it is called) full of it would always adorn the concrete kitchen shelf, no matter which season it was. With Meyer Lemons, that is not the case. When they are in season, one has got to wear their hoarder hats and preserve as many as possible, as they are in short supply. I can’t be sure if they are still available in stores. But, I can guarantee that I saw pretty little “Improved Meyer Lemon” trees, all locally grown in Texas, in Whole Foods market just a couple of days back. If you are a Meyer Lemon lover, you still have a good chance to enjoy them next year, if not this. So, mom makes the best pickles in our family circle. In fact, whenever she visits kith and kin, she loves to bring them a bottle of their favorite pickle as a customary homecoming gift or simply an expression of her love. Back home, it is believed that when it comes to the art of pickling, “you either get it or you don’t”. Hence, pickling is set on an almost sacred pedestal. Since I like to analyze, I figure, may be it is also in part due to the prerequisites of a high degree of cleanliness and hygiene. I had always dreamt of growing up to be a great pickler just like my mom is. This year, I have been especially enthusiastic about pickling and preserving. And this pickle happens to be my first ever try at lemon pickle. Mom’s recipe has been scaled down for the two of us and, the results have honestly been very encouraging. If you’ve never tried your hand at pickling for the fear of ruining it or whatever, just give it a shot. It may seem a little laborious and stringent, but the whole process of pickling in itself is gratifying and calming to say the least, in an almost character building way..
Trust me. Take my word for it. Once you are done with patiently waiting for it to marinate, when you open the lid and the first spicy aromatic whiff hits your senses, transporting you instantly to cloud nine, that is when you’ll believe it was all worth it. Down south, pickles are broadly classified either as fenugreek based or mustard based. As per Ayurveda, fenugreek is considered to have cooling properties and mustard, the opposite. Hence, fenugreek based pickles are usually milder than their pungent pickling counterpart and so, easily suit most people’s tastes. If you already know the taste of Lemon pickle, just imagine how it would be with the magnificent aroma of the Meyer Lemons… I’d say, go on and imagine a bowl of cooling yogurt rice with a side of this lovely pickle. 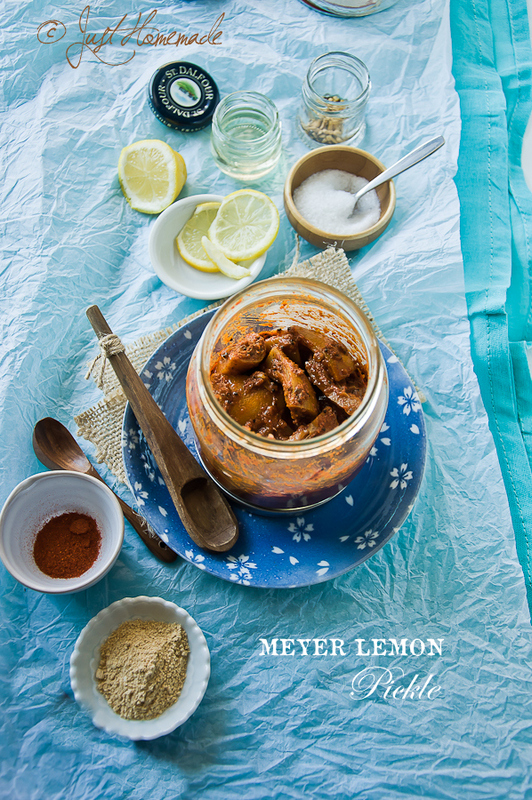 The humble lemon pickle with a Meyer Lemon twist – in one word, irresistible! What’s your favorite Meyer Lemon recipe? Wash the glass or porcelain jar well with hot water and soap and let air dry completely in a sunny spot. Before using, optionally microwave it for 30 secs to ensure dryness. Make sure that all the working surfaces and utensils are completely dry and clean. It is also recommended to use a fresh kitchen towel. Wash the lemons and pat them dry with a clean kitchen towel. Quarter the lemons. Same if you are using squeezed meyer lemon leftovers as well, like I did. It is very important that there is NO MOISTURE in the jar or the lemons. To start with, add 1/2 tsp of salt to the bottom of the glass / porcelain jar. Now go on adding lemon pieces and salt in alternating layers until all the pieces are well covered in salt including the topmost layer. Squeeze in the juice of 2 lemons, if you’re using squeezed lemons. Cut out parchment paper slightly bigger than the lid, line it onto the lid and secure tightly. Let it sit for a week to ten days in a cool dry spot. Shake the jar well or stir the preserved lemons with a long dry spoon once daily to let the salt dissolve. After a week to ten days, these salted lemon pieces will leave juices, slowly sink to the bottom and will reduce in volume too. In a small pan, dry roast the fenugreek seeds on low heat until golden brown and fragrant. Let cool, before grinding in a small spice grinder to a fine powder. In a small, clean, dry bowl, thoroughly mix red chilli powder and 1 tsp roasted and ground fenugreek. Be careful to not overly roast them or they turn bitter. 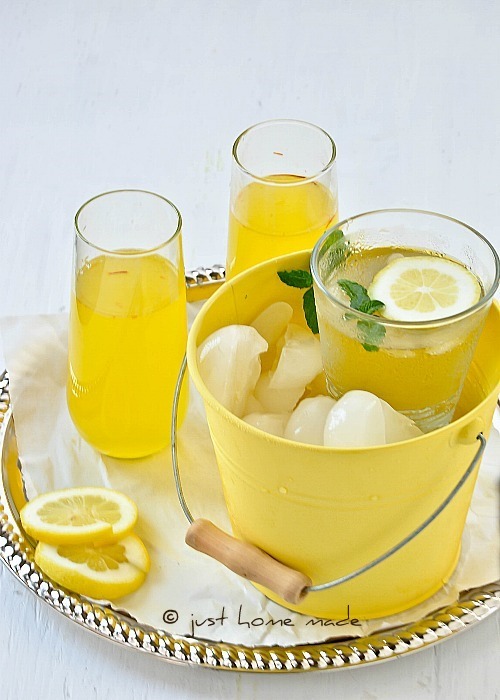 Empty the jar of preserved lemons into a clean, completely dry, non-reacting mixing bowl. Stir in the chilli-methi powder and mix well using a dry spoon. Heat oil in a small pan or kadai for the seasoning. When the oil is hot or shimmering, add mustard seeds and let splutter. When the spluttering almost comes to a stop, take off stove and add hing. Once cooled completely, add it to the mixing bowl and give a good stir. DO NOT add the seasoning when hot or the pickle will develop an odd smell. 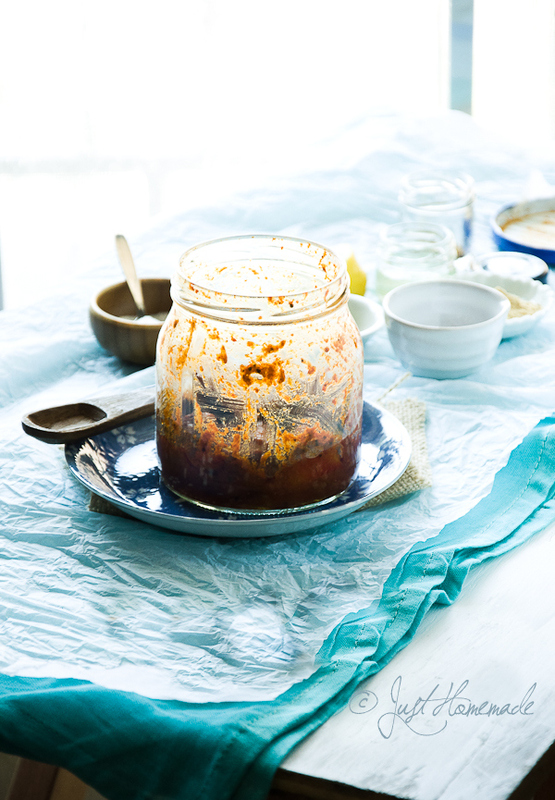 With the spoon, scrape clean and transfer the mixed pickle contents back to the jar without wasting a tiny bit. Secure the parchment paper lined lid tightly. Let the pickle soak all the spices for at least a couple of days before using. Do not handle or mix with your hand at any given point, unless you want a spoiled pickle. Use organic or unwaxed lemons as whole lemons go into the recipe. No need to refrigerate. When stored well, this pickle keeps for a long time. 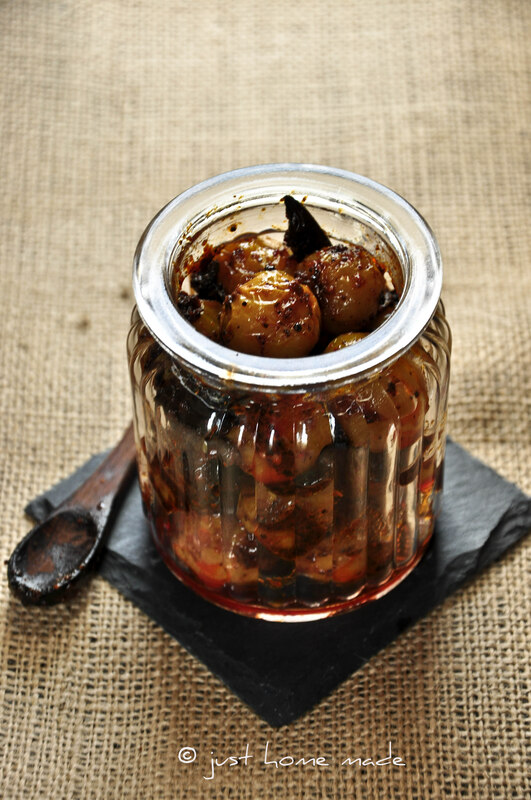 Always use a large enough jar with a wide mouth for pickling, so that there is some room for stirring. I have used squeezed meyer lemon leftovers for pickling. 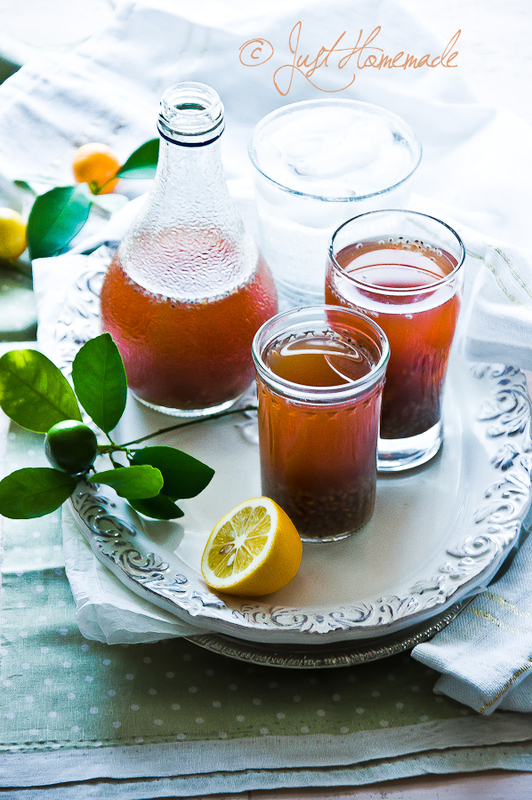 You can start afresh with whole meyer lemons with their juices intact. Omit the juice of 2 lemons in that case. Don’t add more salt to begin with, as it can always be adjusted later. Salty cannot be fixed though. All of the fenugreek seeds mentioned, are not needed for the recipe. However, any less would be difficult to grind well in a spice grinder. Do not discard the leftover ground fenugreek. Store in a small airtight container in the refrigerator for later use. A generous pinch added to the seasoning in your everyday curries gives them a flavor boost. Preferably, use red chilli powder from byadagi variety chilli or any red chilli that is high on color and medium on heat. Parchment paper acts as an additional barrier between the corrosive salt and the metal lid, thus ensuring food safety. If not, a piece of clean cotton or muslin cloth can be used in its place. I find that sea salt is not as salty as regular salt. Please reduce quantity if using table salt. Rock salt is the salt of choice for pickling at home. Adjust quantity is using. i love lemon pickles… in fact all pickles. we just get here the indian varieties of lemon. so the meyer lemon sounds intriguing. this is fab! ever since I read about meyer lemons though your posts, i am hunting for them badly. no luck yet. pictures are great as usual. Yet another wonderful recipe. This is so apt for summer. My mom makes lovely pickles. As you know in a south Indian household pickles are essential as we always finish our meal with ‘Thayir Saadam’ that has to be accompanied with a pickle. 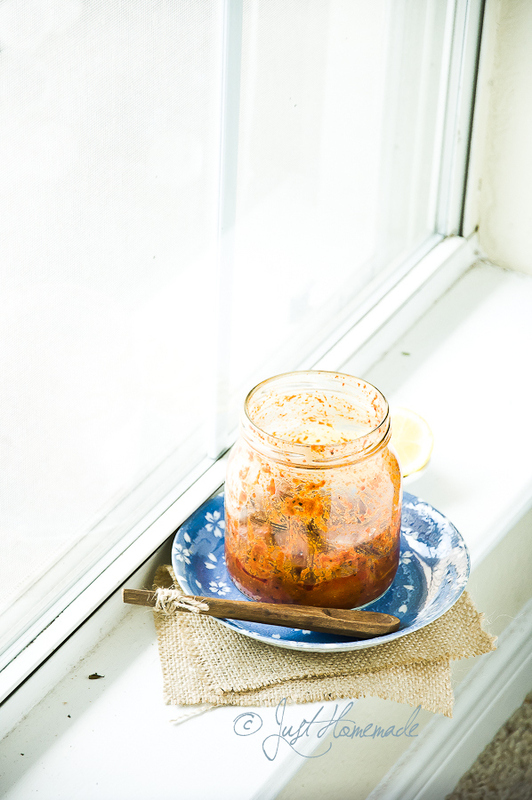 Mom used to make a variety of pickles….lime pickle and mango thokku was a staple back home. 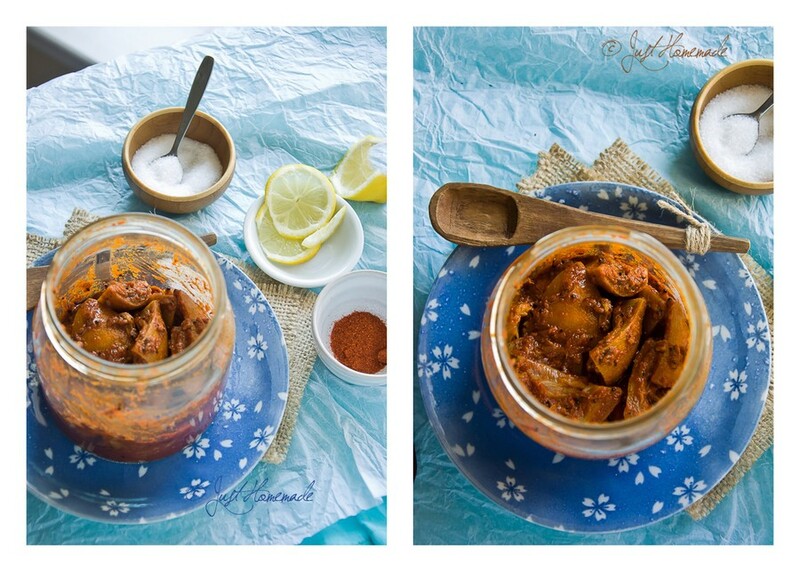 I am a big fan of lime pickle, and as I love lemons, this is definitely one to try! This is the first I’ve ever heard of lemon pickles and it seems appropriate that they can be turned into something hot and spicy. My personal pickle history with unexpected fruit comes from my childhood in Florida/USA when my mother made sweet pickles from watermelon rind. Anyways, Radhika, thanks for the enlightening blog entry and the wonderful photos. You surprised me by saying that. Lemon pickle is very common in India, so common especially in the south that, people either love it or hate it depending on how frequently they’ve eaten it in their daily lives..
Not a great analogy, but something to the tune of “familiarity breeds contempt”! And, most South Indians would consider a side of lemon pickle with yogurt rice as a comforting meal. Fabulous pics! I can picture my mom licking her fingers after feasting on this alone:) Awesome recipe! those are absolutely gorgeous clicks.. lemon pickles are a staple in our house. Please do drop by the Auction fundraiser to help VSPCA,India on my blog, to bid or Share. Shipping is available in US, India, and some international. They are an amazing non profit working to rescue cows, calfs, dogs, all animals and also feed meals to the poor, esp seniors. I just made these on blind faith. Never had them before. The market had Key Limes and regular lemons. I got a dozen of each. The Key Limes were tiny with thin skins. The lemons were the thick skin type. I ordered sea salt off line because I like it better than the dry kind I can get here. The sea salt is nice and moist which I thought would go well with the citrus. I made one jar of lemon, one jar of lime and one jar mixed. Let them sit for 4 weeks in the sun shine. The temp here has been over 100 for the past two weeks. I went outside and checked the jars each day and “shook” them to distribute the juice and salt. They changed colors after a few days and “melted” down by about 1/3. I emptied all the citrus into one big bowl, mixed the spices as instructed and repacked the jars. I went from three big jars down to two. I had NEVER tasted lemon or lime pickles before. These things are wonderful. Bright, salty, spicy, a little heat. The rind is a bit chewy. They are so good. I can see why people rave about them. These were the easiest things on earth to make. TRY THEM!!! I am glad to have found your blog. I just got a box of Meyer lemon from our Sam’s Club here and wanted to make some achar. Glad to have found this post. I made some lemonade with them earlier and it was not as sour. Does this affect the sourness in the achar (Pickle)?